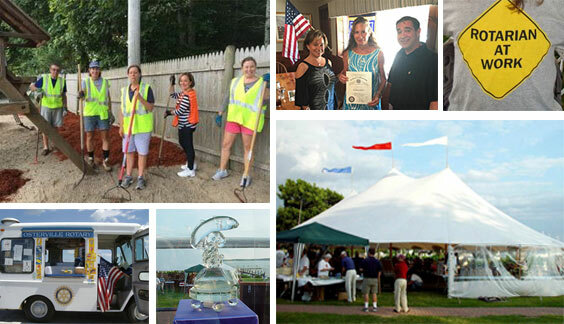 Welcome to The Osterville Rotary Club! The Osterville Rotary Club is part of Rotary International, a worldwide organization of business and professional leaders providing humanitarian service, encouraging high ethical standards in all vocations and promoting good will and peace throughout the world. There are approximately 1.2 million Rotarians, members of more than 32,000 Rotary clubs in 200 countries! We invite you to be part of the world's first service club, Rotary! Come visit us and see if we are the right service club for you! We meet every 2nd, 3rd and 4th Wednesday at Noon at Wimpy's Seafood Cafe', 752 Main St, Osterville and every 1st Wednesday at 5:30pm at a changing venue (contact club Secretary for the venue). Interested in being our Guest Speaker to promote your organization to our Club and our community? Inquiries can be send to Rotary Club of Osterville, PO BOX 705, Osterville, MA 02655 or Contact our club Secretary at rotaryclubofosterville@gmail.com or email us at the email form on the lower right side of this page.